A fruity adventure, beautifully balanced. The high alcohol level doesn't show in the taste. Very appealing already with little water added. Head to head with the very creamy 'Dailuaine 1998 DT Dimensions' this has got a more sparkling and fresh fruit feel to it, but also more bitterness in taste and especially finish. Very fruity, pears, peaches, citrus, pineapple, a tropical fruitiness, also some cucumber, pencil shavings and a mild musty dustiness. An oily and creamy mouth feel. Needs only little water. Ripe white and yellow fruits, pear, peaches, mango, bitter oranges, pineapple, a beautiful bitter wood spiciness. Medium length: bitter fruits, slightly drying and warming woodspices, some nutmeg and a subtle musty note at the end. Bittersweet. Citruspeel. A hint of pear and some mild spices. There is a certain roughness in it. Lemongrass and orange. After a while caramel fudge is there plenty. Love it! Wow. Beautiful, complex, there is a lot going on directly from first contact. It just keeps bumping every corner inside my mouth. Oily/fatty and a little salty. Well rounded and full bodied. Very fruity and mediumdry. Citruspeel and sweet wood influences. A hint of melon and drained wood at the end. Sweet, vanilla, green apple, stimulating alcohol, some sweet tropical fruit later on. Sweet, spicy, pepper, sweet overripe fruit and an indefinable, not unpleasantly bitter taste. Medium long, drying, some wood, sweet overripe fruit, and a metallic aftertaste linger long. Another nose full of fruit: apple, pear, melon orange. This lacks the grassy thing I discovered with the other Dailuaine. A tang of alcohol, but not too much. Fresh and fruity, again. Sweet and sparkling, it is just not white wine. A little bit of bitterness to temper the sweet. Nice round and creamy, fruity. Keep hanging. Tasted in round three of The Whisky Forum Tasting Panel. This was the winner for me. 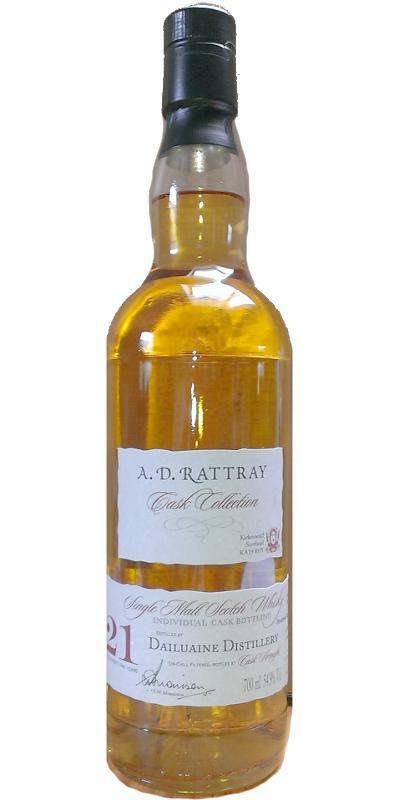 Beautiful dram with a fine oil-like mouthfeel. White grapes, apple, pear. Again a freshly sweet nose. Much sweeter than expected based on the nose. Citrus and tropical fruit, pears, Haribo applecandy, vanilla, a hint of peat, licorice, a bit of wet stone. More than fine. Bourbonbittery, long, going sweet after time. A more than fine whisky. Full of flavor and well matured. For the € 90, - purchase this is an absolute must! Practice! It pops in yes! Melon, sweet tropical fruit, pear on juice. A bit of wood comes back here again. Yet the alcohol remains a bit dominating, probably some water does wonders. With water: Nice round and sweet. A lot of fruit and syrup. Very nice caramel and wood nuts in the nose. A very sweet blow, but very spicy of the alcohol. Here I just need water, otherwise I will not get far. With water: there is a ginger in it. Furthermore, tasty pears on juice, lots of fruit and some wood. At the end some caramel. Long length. Again sweet, lots of fruit on juice, mandarins and also a lot of vanilla sugar and some wood influences. With water: the flavors are now clearer. Brown caster sugar is added and the wood influences become more beautiful. Deliciously fruity (grated apple, applesauce, pears, bananas, grapes, citrus (lemons, lemons, grapefruit), spicy honey, strong vanilla, caramel (firm fudge), very malty, some Demarara sugar, nutty in the shell. Nicely involved in alcohol 45 points. oily, syrupy, many streaks. Creamy-oily texture, with lots of citrus, herbs and spicy oak. Nutty (walnut and sweet-dry in the middle section, voluminous, full-bodied, palate-filling, very tasty, 44 points. Long, warming, lots of citrus, sweet and lingering after toasted oak.